Is it really Spring?!! Yay! After the winter we have had I am so excited to start seeing grass again and flowers starting to bloom! But until then, these flower crochet coasters will add a Spring touch to my inside decor. Want to make some too? Follow along with my pattern and tutorial below. 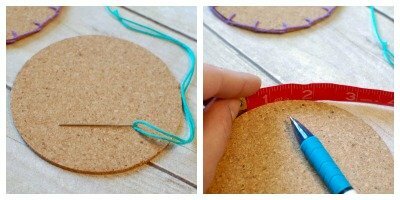 To prep our cork disks for crocheting, we first need to blanket stitch around the disk. I like to mark out my stitches first to make sure the are as evenly spaced as possible, but if you feel comfortable eyeballing it you can do that as well. Using a pen and tape measure, mark every ¾ in. around. Using the Bonbon yarn and a sewing needle, blanket stitch around the disk using the pen marks as a guide for your stitches. To start your blanket stitch, insert your needle through the disk from back to front through the first pen mark, then *insert your needle through the next mark again from back to front but before pulling the thread all the way, insert your needle up through the loop that is created, repeat from * around your disk. When you reach where you began, weave needle under first stitch and fasten in back of disk. Use your Bonbon yarn and a G hook to add your edging. Round 1: Join yarn in any blanket stitch, ch 1 (does not count as stitch), work [1 sc, 5 dc, 1 sc] in same st as join and each st around, join and fasten off — 119 sts. I’m going to try it. Thanks. Thank you for featuring these…love it! These guys are really cute, and so simple. Thanks!!!! 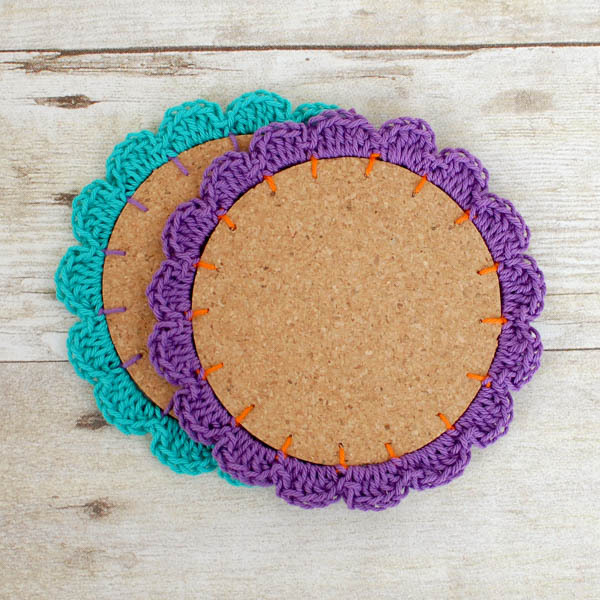 These coasters are amazing…so cute,clever, and easy! LOVE them!